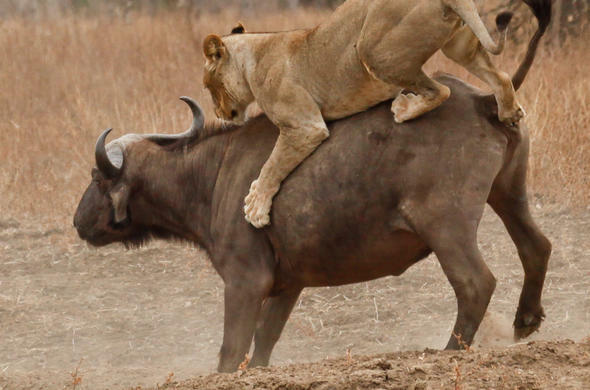 Read a fascinating Savute safari journal account of a pride of Lions attacking a hippo - by Mark & Lizette Carlson, managers of Savute Safari Lodge in Botswana. All our guests had left for their morning game drive at about 7 am, when our guide Eddie radioed to tell us that the lion pride was moving down the channel from Pump Pan. All our vehicles returned to the lodge as we knew the lions would pass in front of the buffet deck. We also knew that they were hungry as they had hunted unsuccessfully for the previous five days. The pride was making it's way to the main waterhole, when suddenly they turned and started running into the bush towards the airstrip side. Banaki saw something grey about the size of a small elephant moving in the bush towards the waterhole. We were all puzzled because there were no other elephants around, and no trumpeting. Suddenly a full grown male hippo came charging out of the bush with the lion pride in pursuit. They then attacked him in the dry channel in full view of all our guests. 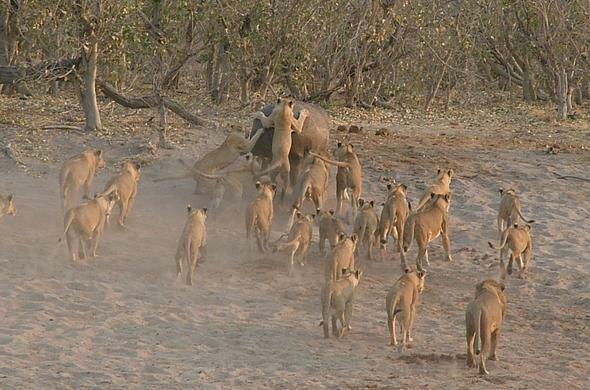 The lions were obviously instinctively wary of attacking from the front - they all stayed behind the hippo and ran away every time the hippo turned to face them. The lions were very cautious! 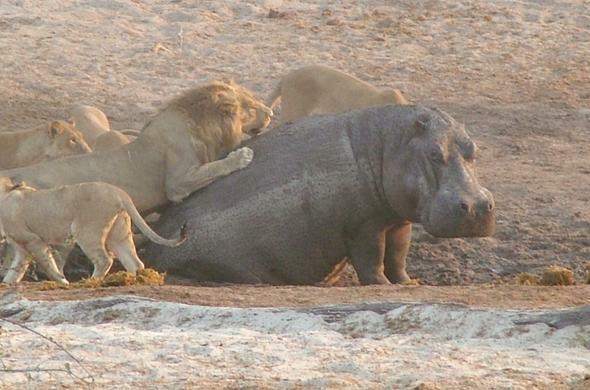 At one stage the hippo sat down, so two lions jumped onto him from behind. We thought 'this is it', but the hippo got up again and ran up the bank into the bush. 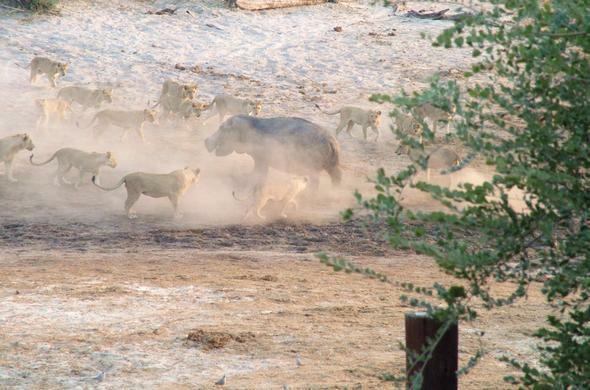 A short while later the lions returned to the waterhole, obviously having been unsuccessful. Six days of no food - lucky for the hippo - unlucky for the lions!! Savute Safari Lodge, on the banks of the Savute channel, is known for its large concentration of Elephant and large Lion prides. Savute Safari Lodge accommodates guests in contemporary furnished, twin-bedded luxury wood, thatch and glass safari suites. Large private viewing decks and en-suite facilities. 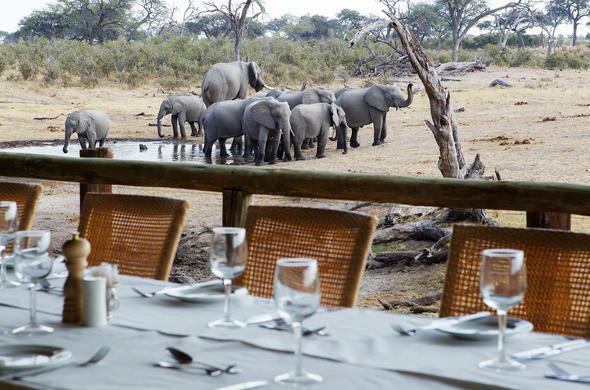 Savute Safari Lodge has a large concentration of Lion and Hyena, as well as Leopard, Cheetah, Black-Backed Jackal and the many lone Elephant bulls. 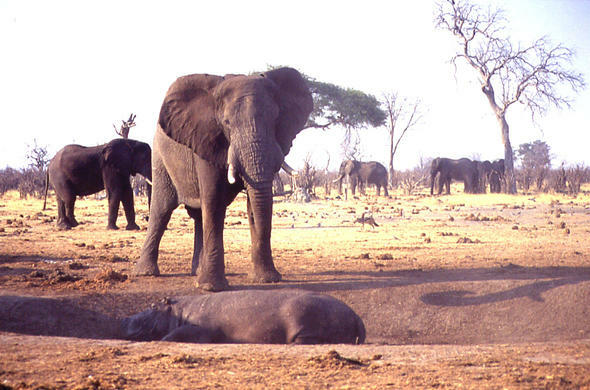 For those readers who do not know, August is a dry month in Botswana and the water holes in the Savute area are at low levels - very far from the ideal habitat for hippo.